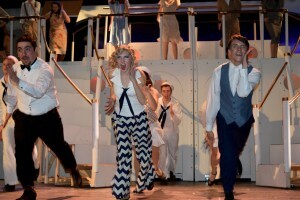 “Anything Goes” is a sophisticated musical comedy about the high-flyers and low-lifes of socialites and gangsters in the 1930s, all put on the same ship headed from New York to London. Many passengers are on board just to rub shoulders with the rich and famous. The ship’s captain is desolated when he learns that two of his famous potential passengers have cancelled. When he learns that two famous gangsters are on board, he is delirious with joy! The passengers are thrilled. The audience is wowed! Scott Sipes nearly steals the show with his crazed portrayal of gangster Moonface Martin who is masquerading as a respected minister. Sipes is an excellent comedian who lights up every scene where he appears. Not to be outdone, however, are several supporting characters including Owen Arranow, Raegan DeBord, Lyndsey Rantz, and Brynn Ledermann. 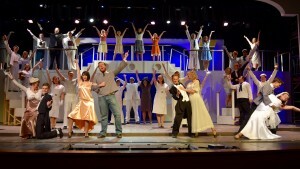 The cast is enormous, with many students playing more than one role in the ensemble. And everyone can dance! Tammy Johnson was named as the production’s choreographer last fall, and has put the group through their dancing drills for nearly six months. The effort pays off with great success. Persons participating in athletics must go through substantial rigorous training to be at the top of their game. 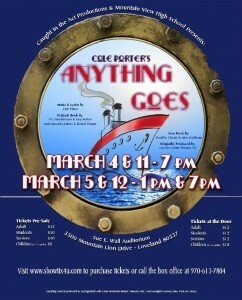 Students in “Anything Goes” have been through similar training to come out on top in their achievement on stage. The training will probably prove to be greatly rewarding as they face life’s challenges beyond high school. The entire show is a winner. The costumes look as if they came from designers of the 30s. The shipboard set is great fun, as performers run up and down the stairs, and in and out of the staterooms. Lighting is effective, and the orchestra is amazing. When the overture was played, I was under the impression that the excellence was a recording. Not so — the show is entirely “live.” And what a lively one. The orchestra was conducted by Peter Toews. Technical Director was Phil Forman, with Bryan Kettlewell as Musical Conductor. The story is a zany tale of shipboard antics. There is a chance for several performers to show their individual musical talents as well as high-comedy skills. Much of the Cole Porter music is familiar with such favorites as “I Get a Kick Out of You,” “It’s De-Lovely” “All Through the Night,” “You’re The Top,” “Blow, Gabriel Blow,” and the show-stopping “Anything Goes.” The original show premiered in New York in 1934, and has gone through several revivals, two movies, and thousands of local productions. The Mountain View production is a winner. The students on stage are front and center, but have excellent back-up with the technical crew, and adults who have spent incredible hours to bring the show to such a delightful conclusion. Previous PostGilbert and Sullivan’s “Pirates of Penzance” is Rollicking Tale in LovelandNext Post“The North Plan” is a wild and thought-provoking tale of civil unrest and martial law possibilities.